At 4:15 this afternoon in an attempt to help my colleague in the Philly office track down one of our Canadian co-workers, I decided to check my desk calendar to see if there was some wacky Canadian holiday today. I thought is could be a valid reason why no one in that northern nation was answering there phones -ey? No wacky Canadian holiday, but was what I saw correct? Hanukkah started tonight? 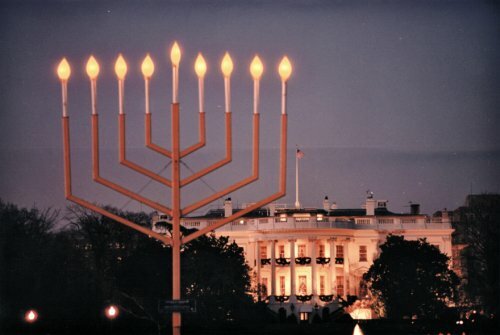 I knew the festival of lights was upon us, but I still felt I had time to get our Hanukkah cards out to our Jewish relatives. Umm not so much. I was prepared in the since that I had dedicated a shelf in our living room in honor of my husbands heritage. It holds our menorah, candles, a few dreidels, and Harry the Hanukkah bear. Don't worry he isn't some official mascot of Hanukkah that you didn't know about, just a beanie baby bear with a yamaka and sweater with a Star of David on his chest-like this little guy. Our Hanukkah shelf found in a home who's halls are decked with Christmas decor, reminds me of the Hanukkah corner we had in the living room of the sorority house in college. Ahh just thinking of that wonderful mish mash of blue and silver garland in a room filled with three Christmas tree's, brings back fond memories. 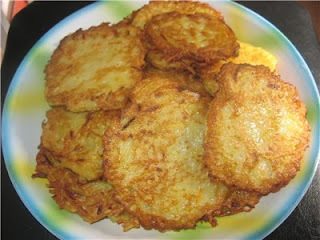 Good thing Josh's favorite Holiday is Christmas and my favorite Jew food is potato pancakes. It makes for a happy marriage and lots of presents in the month of December. Maybe we'll even make a trip to the National Menorah this weekend, bet you didn't know we had one huh?